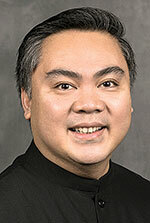 Benedictine Novice Dennis Reyes was clothed in the Benedictine habit on Jan. 19. He now begins a year of monastic formation, including study of the Rule of St. Benedict and monastic history. Novice Dennis, 42, a native of Manilla in the Philippines, earned a bachelor’s degree in music at the University of Philippines and a master’s degree in music composition and theory from the University of Nevada. He expects to earn a doctorate of musical arts in composition from the University of Illinois in May. The winner of numerous awards in international music competitions, Novice Dennis most recently was awarded the grand prize at the Sond’Ar‑te Electric Ensemble Composition Competition in 2016 in Portugal in which composers from 18 countries took part. He also participated in the International Electroacoustic Music Festival hosted by the Conservatorio Santa Cecilia in Rome.